Everyone’s story is different. Maybe you got your first job when you were still in high school, and have been working steadily ever since. Then again, maybe you left the workforce for an extended period of time— whether to go back to school, to raise a child, or to contend with some medical issues. There’s nothing wrong with any of that, of course—but it can lead to some resume complications. How can jobseekers address gaps in their employment history? Here are a few positive, pragmatic tips from our resume writing team. First and foremost: Remind yourself that there is nothing wrong with taking time off for pursuits as noble as raising a kid or going back to school. It may give you an unconventional career trajectory, but it is nothing to feel ashamed or sorry about. Avoid taking any sort of an apologetic tone on your resume—because frankly, that can scan as negativity, which is the last thing you want on your resume. Your resume doesn’t have to do all the heavy lifting! If you have a year or two where you weren’t working, you can bring it up in your cover letter—noting succinctly (and unapologetically!) that you briefly detoured out of the workforce to care for an ailing parent, seek medical attention, or whatever else. Don’t be timid about offering a quick and direct explanation, then moving on. Most of the time, we recommend a chronological work history—but if your work chronology is a little weird or wonky, you may benefit from a functional resume, one that’s laid out by skills/competencies rather than a straight job history. This can be a smart way to emphasize your strengths while being discreet about your absence from the workforce. Sometimes, an absence from the workforce is all because you had a really bad wok experience, and just couldn’t stick around any longer. That’s fine, but make sure you never lapse into complaining about a former boss—no matter how bad the boss was! Simply put, nobody wants to hire a complainer. Don’t brand yourself that way. If you missed a few months or a few years of work, it’s important to let employers know that you didn’t lose your mojo in the interim. Make sure you include plenty of strong, specific achievements from before and after your time off. And if you’ve not yet returned to the workforce after a long absence, include some details about what you did during your time off—such as volunteer work, freelance projects, or continuous education. Just make it clear you weren’t sitting idly by! Could your resume do a better job of addressing an employment gap? Ask our resume writers to help. Give us a call and schedule a resume consultation—www.grammarchic.net or 803-831-7444. Does Your Resume Suffer from TMI? The role of any good resume is to provide valuable information—data that helps a recruiter or hiring manager make their decision, and ideally material that causes them to decide in your favor. It is possible, however, for your resume to have too much information. The result? A resume that is either unfocused or simply difficult to read. But where do you draw the line? When have you officially reached the point where you’re trying to pack too much content into your resume? Here are some warning signs for every resume writer to be aware of. Your resume is too long. Most candidates will have a two-page resume with only senior or C-level job seekers extending their document to three. On the other side of that, one-page resumes are usually only for entry-level job seekers. Remember that your resume is meant to curate your career highlights and arrange them in a way that’s impactful; it’s not meant to be a transcript of everything you’ve ever done or said while on the job. Your resume has big blocks of text. Your core competency and career history sections should both take the form of bulleted lists—condensing your noteworthy points into brief, easy-to-read points. If you have huge blocks of text, anywhere outside of your executive summary, that likely means you haven’t trimmed or curated well enough. Your resume repeats itself. There’s really no need to pad your resume by reiterating the exact same skillsets for every single job listing. By all means, opt for a shorter resume instead of a needlessly repetitive one. Your resume has personal information. To be clear, some personal details are legitimate—even vital. Think specifically of contact information—name, address, phone number, email address. What you don’t need to include are age, marital status, race, etc. A good resume packs a wallop by telling your full story without any needless information or repetition. Our resume writers can help you achieve that kind of focus. Contact Grammar Chic, Inc. today to schedule your resume consultation: You can reach us at 803-831-7444 or www.grammarchic.net. Few things are more discouraging than seeing an open job position that sounds just perfect for you—the kind of role you want, at a respected company, with great benefits—only to find that you’re not technically qualified for it. The recruiter wants five years of experience, and you just have two; or, there’s a list of specific skills needed, and you only possess a handful of them. A lot of jobseekers run into situations like these and just move on. Of course, that’s perfectly reasonable—but here’s the thing: Underqualified people get hired for great roles all the time—and often, they end up really excelling. So what can you do to make yourself competitive for a position that, on paper, you’re not suited for? Here are a few tips. Show off the skills you do have—enthusiastically. The recruiter has a list of skills that they want to see—but your job is to take their mind off that list and focus them on your list. Use your resume to sell yourself, highlighting the breadth of your experience and the wide range of things you can do well. Focus on the value you offer, and the specific achievements you’ve had. Build a case for yourself as a uniquely talented and multi-faceted applicant. You may lack some of the technical skills needed for the job, it’s true—but that doesn’t mean you can’t learn them. Use your resume to showcase the fact that you’re a quick study and an eager learner. Show off your continuing education and the ease with which you adopt new talents. You can use a strong cover letter to fill in the gaps and really convince the recruiter that your candidacy is serious. Paint the big picture, portraying yourself as a talented and enthusiastic applicant who is ready and able to learn new things and really grow into the role. Be a positive force in your interview. When you sit down for the job interview, that’s when you really have to sell yourself effectively—shifting focus away from the ways in which you fall short of the requirements, and toward all the ways you shine. Avoid negative phrasing (“I’ve never done,” “I don’t know,” etc.) in favor of positivity: “I’d love to work on,” “I’m eager to learn,” etc. You may not be the best candidate on paper, but that doesn’t mean you have to take no for an answer. A solid resume and cover letter can get you in the door, and convince hiring managers that you’re just the right person for the job. Get your resume materials up to snuff with a little help from our team; contact Grammar Chic at 803-831-7444 or http://www.grammarchic.net. The goal of writing is always to articulate your point clearly—and that’s true whether you’re penning a novel, a company blog post, or your own resume. A resume that is unclear, or that makes the reader work way too hard to find the desired information, isn’t going to be much of an asset to your job search. In fact, it’s probably just going to be discarded. Recruiters and hiring managers tend to get a lot of resumes for any open position; if yours is the one they have a hard time deciphering, there’s not much point in them keeping it around. So what makes a resume such a chore to read? There are a few common resume design elements that fall under that heading. Here are five of the most common—all things you definitely want to avoid. The eye naturally wants to see some empty space on the page—not just one big block of unbroken text. So when you put in super-thin margins, tiny fonts, and no real breaks in your resume narrative, that makes the whole thing look like a headache. We know you may want to condense 30 years of work history onto one page, but there are better ways of achieving brevity in your resume. Calibri and Helvetica are a couple of font choices we really recommend. Anything else is immediately on shaky ground. These are the agreed-upon resume formats because they’re easy on the eye; don’t risk the use of a fancier font, which might just be annoying for your reader. You want to make it clear that you know your industry well, but you also want to make sure the resume is readable to someone who isn’t in your field—as many recruiters won’t be. Try to avoid industry buzzwords as much as you can. Here’s a little secret: A lot of hiring managers and recruiters like to skim resumes before really reading them in earnest, and what they’re looking for as they skim is numbers. Metrics and statistics catch the eye and make your resume more appealing. Include them when you can. Spelling and grammar matter because they make your resume easier to read—period. Typos are inherently confusing, to say nothing of unprofessional. Proof well! Anything that makes your resume harder to read is compromising your job search. 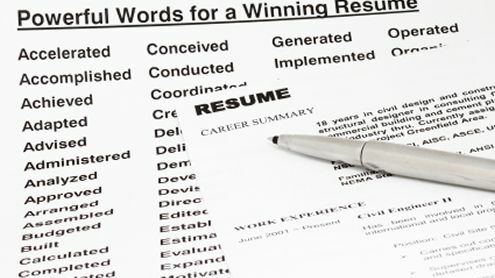 It’s vital to make your resume easy to digest—and that’s something the Grammar Chic resume writing team can help you with. Contact us today for a resume consultation. You can reach us at www.grammarchic.net or 803-831-7444. There is no denying that the job market is a fierce and competitive place. Dozens – and sometimes hundreds – of people vying for the same openings. As a job seeker, you want to stand out among the crowd, and one of the first opportunities to do so is to have a strong resume. Hiring a professional resume writing service can be a great place to start. Let’s face it: not everyone excels at writing or being able to talk about themselves and their accomplishments. Some people haven’t written or updated their resume in years and expectations have changed. But in most cases, your ability to write a resume doesn’t impact your ability to do the job for which you’re applying. We turn to individuals and companies to support us in so many other facets of our lives, so why not writing a resume? When it comes down to choosing a resume writing service, not all businesses are the same. It’s important to select a company that you can trust and whose services align with your needs. So what should you look for? No one can guarantee that you will get a job or even an interview. That relies on many other factors aside from your resume. However, a solid resume can increase your chances of landing an interview. Do you simply submit all of your information online and in a few days your new resume appears? Or do you actually get to collaborate with the writer? Grammar Chic engages in a one-on-one phone call with each client to learn more about them, their background, career path, work history, accomplishments, strengths, and more. This allows for a more personalized resume aligned with the client’s unique needs and capabilities. What are you getting in return for the cost? Going with the cheapest or most expensive company is not always the best choice. Look at what they offer. What type of consultation do you receive? Are edits or revisions included? What is the turnaround time? Is LinkedIn uploading provided? Do they offer other services such as cover letters and thank you notes? Paying a little more upfront can be beneficial if you’re receiving comprehensive services. You’re paying for a professional service – it’s okay to ask questions! Find out what type of results you can expect and what other clients have to say about the company. Check out the company website and reviews. Gather as much information as you can to provide to the resume writer. This includes old resumes, job descriptions, performance reviews, awards, certifications, professional development, etc. Spend some time reflecting on your career and the things you are proud of. What skills have you developed that will benefit your next employer? What you do you feel your best strengths are? This can help to ensure that your new resume is a positive and accurate reflection of who you are. Just make sure you’re being honest. There’s nothing wrong with hiring a resume writing service to help you with your resume. The job market is always changing and a professional company stays up-to-date with the latest trends and standards that you may have overlooked. If you’re unsure about where to start when it comes to your resume, or you’re not getting the results you had hoped for in your job search, contact Grammar Chic today to learn more about our resume writing services. Email info@grammarchic.net or call (803) 831-7444 to get started. Seeking new employment can be stressful—especially when you’re not already earning a paycheck somewhere. That stress cannot be totally mitigated, but perhaps it can be reduced. At the very least, jobseekers can stop stressing about the things that just don’t matter, saving their worry and their attention for the bigger, more significant issues. In other words: Know what you should legitimately be concerned about, and what you can let go of. We’ll offer a few quick examples of the latter—four things that many jobseekers worry about, but really don’t need to. The occasional gap on your resume. While it’s certainly problematic to have a resume riddled with holes, a few short gaps here and there—especially ones in the distant past—are really nothing to fret about. Maybe you took three months off from your career to care for an ailing parent, or you took a sabbatical while you returned to school. An employer may very well ask you about these gaps, but all you have to do is give your explanation, and the employer will almost surely understand. It’s nothing to get hung up about. Requests to contact your current boss. You may be asked if the hiring manager can get in touch with your current employer, as a reference—and you may prefer that this not happen. More likely than not, your job search is something you’d rather keep secret. The good news is, employers understand that, and declining this request is perfectly normal. Don’t hesitate to ask the hiring manager not to let the cat out of the bag with your current boss. Jobs left off your resume. In the interest of telling your story, as succinctly as possible, you may want to omit a job listing or two from your resume—and that’s okay! Now, should you leave off a major job that leaves a seven-year gap on your resume? Probably not. But if you need to cut off your summer internship from back when you were 18, well, that’s not likely to be an issue. An unwieldy list of references. You may have former employers or colleagues on your list who have since moved on, or even retired. Contacting them might be challenging—but that’s not really your concern. When a hiring manager asks you for references, he or she is only asking for your permission to contact those folks. The logistics aren’t your concern! Another way to eliminate worry from your job search? Make yourself confident by getting a sparkling new resume. Start the process today by contacting the Grammar Chic team! You can reach our resume writing pros at 803-831-7444, or at www.grammarchic.net. Writing a decent resume is part art and part science, and there are aspects of it that require real skill. That’s why more and more jobseekers are entrusting their resume writing to trained professionals, like the Grammar Chic team. Yet there are other aspects of resume writing so basic that the pros aren’t really needed. For instance, formatting mistakes are common, and can wreck an otherwise solid resume—but it’s easy enough to learn these blunders and to avoid them. And they may not seem like much—but trust us: They buck both aesthetic and resume conventions in such a way that may make you seem unprofessional or amateurish to a recruiter. It is no exaggeration to say that messing up one of these trivial details could cost you your job. Error #2: Using inconsistent formatting. This should really go without saying, but when you’re listing employers, job titles, and dates, consistent formatting is essential. Double and triple check your resume to ensure that you’re doing things with uniformity. Error #4: Submitting a page-and-a-half resume. It isn’t possible 100 percent of the time, but we really encourage people to aim for either one full page, or as close to two full pages as possible. A page and a third just looks awkward and incomplete. These points may all sound basic—and they are. That’s why it looks so bad when you get them wrong—and why it’s simple enough to master them on your own. But for any help or more complex resume writing needs, don’t hesitate to call Grammar Chic at 803-831-7444; or visit us online at www.grammarchic.net.